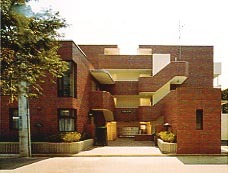 Azalea House is located in a quiet residential area in Tokyo, close to subway station and within easy access to downtown and business area. Four-storied apartment style residence including a lounge with T.V. FEATURE Azalea House is close to Heiwadai station on Yurakucho-Line, which provides very easy access to Sophia University (Faculty of Comparative Culture) . EQUIPMENT Online computer available in the lounge. Coin laundry, vending machine, pay phone. ROOMS All rooms are furnished containing kichenette, refrigerator, bathroom with toilet, air-conditioner, heater, bed, desk, closet and telephone. Applicable to those who intend to stay more than 1 week. Please email to Mizuno who is the person in charge.